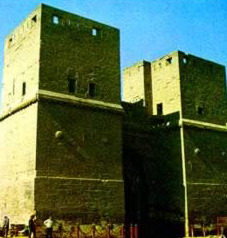 Bab An-Nasr or the Victory Gate is located near the Khan al-Khalili market and to the east of Bab el-Futuh, and connected with it via either an interior route throughout the Fatimid wall, or atop the wall. Other than its square towers, which were built at the same time as those of Bab el-Futuh, the gate itself is very similar to its eastern counterpart. There is a short inscription on the gate made by Napoleon's army during their occupation.